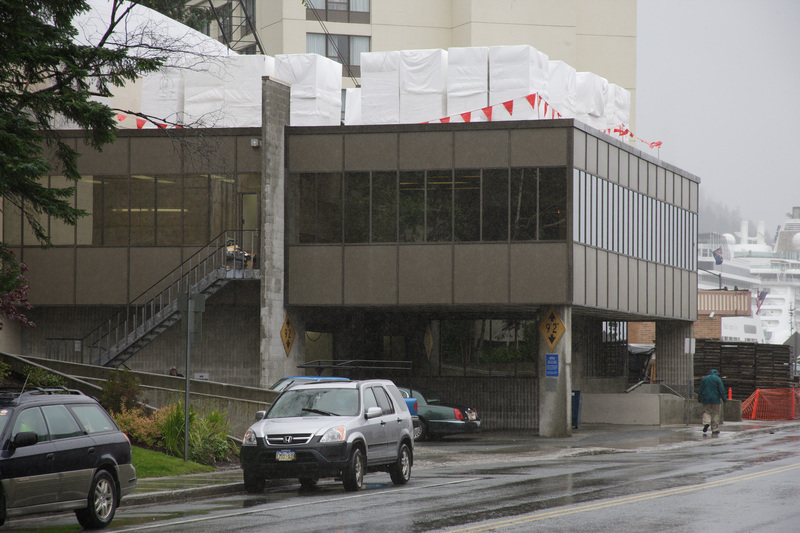 In the wee hours of August 17th 2009, rainwater flooded the collections of the Alaska State Archives in Juneau. The following is the timeline of events, challenges, and insights compiled the following week and discussed at a group debriefing. Sunday August 16: Rainstorm with considerable wind. Monday August 17: Rainstorm continued with 1.8” of rain. Cruise ship Pacific Princess with about 600 passengers skipped Juneau port of call because weather is too severe to safely hold anchor. Montana Creek threatened to flood. At some point late last night or this morning, construction bubble ripped off the roof and rainwater entered the Archives. Resident nearby heard cover rip off at 5am? Head of Archives was on vacation, Records Manager discovered the flood at 7am There was a ¼” puddle headed for the electrical panel and people walking in the water. Safety hazard. Contractors were talking about turning up the heat, but this was not done. HVAC was turned off completely around 9am. 10AM all standing water was removed for 2nd floor, gone from ground level around 11am. Centennial Hall was called but was unable to give space. On day 4, they offered their space but it was not needed by then. Head of Alaska State Library – Historical Collections (ASL-HC) secured the Juneau Arts and Culture Center (JACC) around 8 or 9am. There was a pre-existing verbal agreement with the JACC director to use the space in an emergency. JACC building was dealing with its own roof leak. Curator of Museum Services from the Alaska State Museum (ASM) provided expertise, organized conservation response and facilitated connection between locations. Hair dryers, fans and dehumidifiers secured. JACC had 4 humidifiers and 4 fans running. Some items were purchased by the contractor, but personal calls to friends in other state divisions was most effective. Juneau Douglas High School (JDHS) was a key source for tables (school not in session). End rolls of newsprint secured from Juneau Empire. State senator from Juneau visits site. Chris Hieb rescues wet document boxes. Photo by Damon Stuebner. Recovery efforts established in the atrium of the State Office Building (SOB) atrium. ASM Curator lined up a refrigeration van from AML barge lines, awaiting approval from administration. 4pm, 200+ more wet boxes were discovered when the emergency when about 52 hours old. Department of Education and Early Development Commissioner stopped by today (and the next day,) two members of the Alaska House of Representatives came by the JACC. Still discovering how far the leak penetrated, scope of emergency still not known. Refrigeration van ordered by State Records Manager, coming up against the window for mold to get established. Van arrived in the morning. 260 boxes placed in the van, wrapped in plastic trash bags first. Stacked two high in the freezer van. Needed a special energy source, so van was taken back to the barge line out Thane road and plugged in there. $25 per day rental and $25 per day electricity. Use of the ASM’s non-collections storage space in the Public Safety building nearby for temporary storage of processed dry boxes. Most WAAC conference volunteers had passed off their roles to staff, but the paper conservators kept working even though the WAAC conference had begun. Juneau City Clerk offered to put together a crew to work over the weekend if needed. Humidity strips ordered from Talas, they shipped them ground by accident. Recovery efforts had to vacate the JACC by 11am due to incoming event. About 1000 boxes impacted during entire emergency. 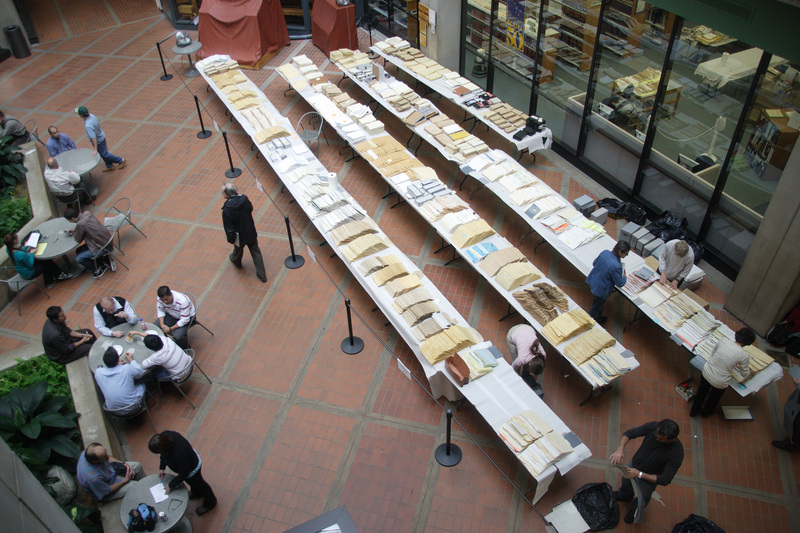 Archives has about 24,000 boxes in its collection. Head of Archives empties dehumidifiers. Many people came in to fluff and flip pages. 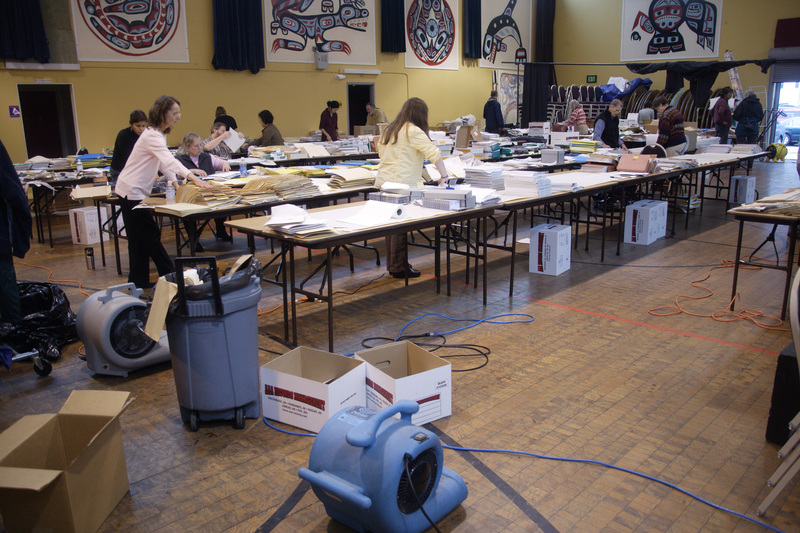 The Juneau Arts and Culture Center donated space to the recovery effort. Photo by Damon Stuebner. 10 frozen boxes were processed as a trial run, 5 in SOB and 5 at Archives. Transported from Thane Road by panel truck. They were allowed to thaw for about an hour on the floor with the top off the box. Coordinator for the Archives Rescue Corps project (a grant-funded initiative to identify archival collections and needs statewide) gave a best practices chat and sent around email list about it to help get everyone on the same page. Some of the frozen boxes had really wet materials, even though it was assumed they might not be too bad. Head of Archives planned to unplug fans and dehumidifiers in Archives to see where things were in the morning, but that actually happened on Friday. Down to only one volunteer in SOB, two in Archives. Library staff on ¾ time recovery, and ¼ time regular business. Archives still 100% on recovery issues. Library to remain closed this week, Archives will also remain closed next week. Archives responding only to pre-existing reference requests, not taking new ones. Everything that was wet that was NOT on the freezer truck was dealt with. Another 60-70 boxes total pulled from freezer truck to process. Warmer and more humid than normal in Historical Collections today. Related? Is HVAC compensating? Resolved with fans. Instrument in the stacks reads 66.6 degrees F and 60%RH in the morning when ASM conservatorreads it. Raining really hard outside today. Started to leave the SOB atrium, and moved into the info services area of the library. Humidity strips finally arrived in the afternoon. All materials finally all out of the SOB atrium. Turned off dehumidifiers and fans in the Archives stacks and closed the doors. The atrium of the State Office Building, just outside the Alaska State Library, was another location for the recovery effort. Photo by Damon Stuebner. Debriefing summary meeting. Remarkable, even a week later, how different people’s memories and assumptions were. Very civil, however. After today, 15 boxes are still frozen. Dock, garage and vault cleaning is finished. Archives loading dock. Photo by Damon Stuebner. Incident Command System (ICS) not fully implemented FEMA training needed. People are sensitive to chain-of-command issues and this came up several times: being denied use of Centennial Hall, delay in accessing certain volunteer pools, people taking initiative early on such as covering things with tarps because they did not want to “step on toes”. Although there was leadership, people were still confused about who was in charge. Some volunteers left when they could not find someone to give them direction. Hard to communicate over multiple locations (Archives, JACC, SOB). Someone to go around to each group and describe how to process a wet box would have helped standardize the system earlier. Especially the order to lay out box contents so they could be re-packed accurately and efficiently. People wanted a sense of prioritization in the materials recovered, although this was difficult in the early days of discovering the extent of the emergency, and prioritization may have slowed down efficiency. Are people working to save things that have duplicates elsewhere while unique rare items are still wet? Would have been nice to have an Archives representative working at each site. Having a laptop with Archives database Minisis on it would have been nice. Tracking in general was difficult. Tracking which box was re-shelved in order to include it in the re-checking plan. Document safety: Records with confidentiality issues are being dried in asecure office. Someone needed to stay with papers in SOB atrium until building was locked each night. 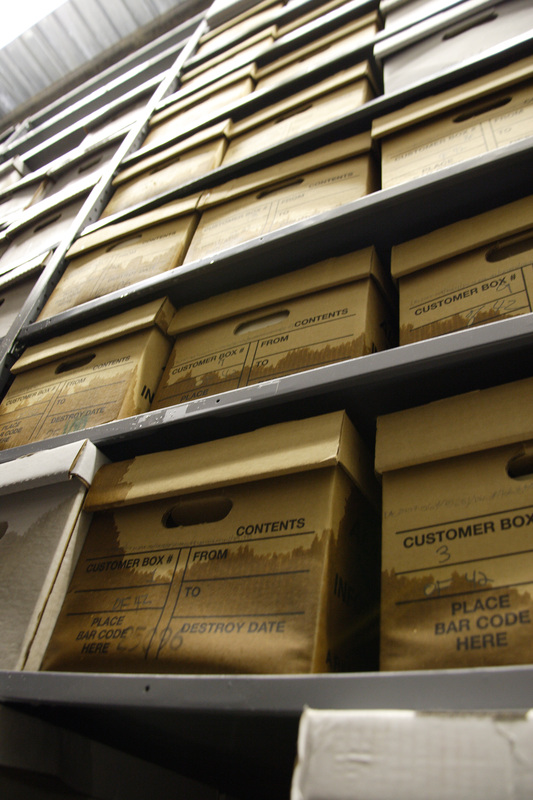 Confidential records include: personnel records, social security numbers, health information, Department of Law or Attorney General files, vital records (birth, marriage, death, adoption, child custody,) court records such as names of victims, prisoners, witnesses, juveniles, parolees, pre-sentence reports etc. Space needed to pile up processed material before it could go back to Archives. Wet documents put into dry boxes for transport had a star drawn on the lid, but many people did not know what the star meant. Some papers may still have been damp when sent back to storage. The coolness of the paper from all the moving air hard to distinguish from the coolness of being damp. Touch testing to determine dryness. If your hand is sweaty or damp, also harder to determine dryness. Things are left for several hours to dry, sometimes overnight. Damage mainly things being some running of ink making things illegible, some photos stuck together. Blue ink ran through to pages below. “Gel” ink pens also run badly. Red on the red-edged labels would bleed. Dry-erase typing paper from the 1970’s had a coating that made it stick together. Envelope adhesives activated. Labels on folders tend to fall off, even when not wet. After boxes re-shelved, it was discovered that some records were completely illegible, but put away after they dried without further review, as had been intended. Some papers had swollen or wrinkled to the point that what was contained in a single box now requires two boxes. Those are marked 1 of 1, 1 of 2 etc and put in the Head of Archives’ office for updating of Minisis. 40lb Hollinger boxes were slightly larger than the 32lb AAA boxes, lids don’t fit. Physical labor challenging, but concern that professional movers would not have the handling skills necessary, plus there needed to be careful record keeping as the boxes moved. The Archives dock was a bottleneck, due to the number of people and the space. Many people did not feel comfortable driving the big van. Fans are loud and create an annoying breeze. People are getting hoarse from shouting over them. People need to take breaks, and while having food on site was convenient, there is also benefit to walking away for a little while and clearing one’s head with a change of scenery. There was a ¼” puddle headed for the electrical panel and people walking in the water. Safety hazard. More first aid kits needed for paper cuts, staple wounds etc. Building facility staff sometimes contributed to more problems, such as needing to move many tables in order to water plants.Circuits at the JACC were not able to handle as many hair dryers as we wanted to use. Almost another disaster when smoke from welding on the roof caused one zone to go into alarm. Another zone would have caused a Halon discharge, causing more damage and costing perhaps $100,000 to replenish, not to mention leaving the Archives storage without fire suppression. Archives HVAC system can only increase humidity, not decrease humidity. Hard to know the extent of the damage because the water traveled but also because a box could be very wet but the contents could be OK or vice versa. Took several days to know the extent of the emergency. Humidity went up in the Historical Collections, perhaps because fans used regularly in there were re-purposed for the emergency. Issue of putting other collections at risk during the emergency? Was it better or worse to have the JACC loading dock door open? It happened to be raining outside, and no rain was coming in but the RH question was hard to resolve. Dumpster space needed for throwing away wet discarded material. Lack of understanding about the difference between freezing and freeze-drying. Archives loading dock area. Photo by Damon Stuebner. Lucky that it was clean rainwater and not dirty groundwater. Vault containing the oldest and most vulnerable archives was not very impacted. Cardboard boxes and file folders absorbed water and were sacrificial, often the archival material itself was not wet. Boxes that held reel-to-reels also sacrificial. Easier to handle the foldered papers than the bound books that had been in the library flood a few years ago. Fanning out folder contents with folders on the bottom promotes drying, but you must counteract blow-away. Leaving staples, paper clips etc on helps (and then discard those fasteners to make it easier to put folders into boxes.) Weight the papers. Improvised weights included nuts & bolts, pellet gun shot, sand, cat litter etc put in ziplock bags or envelopes taped shut, clean plastic bottles, or small Tupperware containers. Instead of cutting boxes to capture info before tossing them, photocopy the box instead. Not taping things to boxes, since that may not last, but rewriting info on new box and then dropping the old label or a copy inside. Helps track if “frozen” is written on an impacted box. Putting wet boxes in plastic trash bags in order to put them in the freezer truck helped move them, keep them together if they started to fall apart. Wet feet will freeze to floor of the van. More gloves against the cold would have been nice. The frozen material did not behave any differently than the non-frozen when it was processed, but it was harder to tell when it was dry because it was cold. Getting newsprint endrolls was really lucky, helped to go there and ask in person in the morning. If school had been in session, we might not have gotten any since teachers love them. Good attitude, people were nice to each other, overall sense of calm. Tone was set from the top down. LAM-wide emergency response committee was the core of leadership during the event. Some kind of more regular daily meeting might have helped, even if not everyone could attend. Having a summary email coming from the Director of LAM is good, because her name carries weight and people will read it. Wet document boxes in Archives stacks during the emergency. Photo by Damon Stuebner. System for box checking and then random box checking. Should a paper conservator come back to do a debriefing and help assess the damage? Eventually rotate in acid-free materials for any non archival materials used in the recovery. Some folders used for the recovery are smaller and shallower than the original folders as well. Having staff read over contracts, be on first-name basis with contractors? This entry was posted on Tuesday, October 13th, 2009 at 10:29 am and is filed under PROJECTS & IDEAS. You can follow any responses to this entry through the RSS 2.0 feed. You can leave a response, or trackback from your own site. You and the people involved in the recovery of this material have done a great job. The blog of this is also very useful. How fortunate to have the group of conservators available to come and help. Your lessons learned are very important for planning purposes, not only for Alaska but for any agencies that become split among several locations due to a disaster. I agree that the ICS system training would be beneficial… the command structure is so important for maintaining communication and structure when plugging volunteers into the role of working within the disaster response. It also helps to create teams of people… when we are isolated we don’t do so well. I suspect you had access to the AIC-CERT website and Heritage Preservation for resources but your blog does not mention this. Sometimes just having the AIC-CERT hotline people be a removed resource for daily checkin can help. You are so right in the observation that it is emotionally hard to work with disaster response of the collection that you have worked with daily. Breaks, food, drink and clear tasks are vital. Our brains shut down and can only manage a few things as we grieve. We should be slower and methodic at first and then speed up as we start to recover our senses. That is opposite of what our adrenaline laced emotions tell us at the time. The pre-disaster planning that had been done was very helpful to this situation. I am very sorry to hear that you all had to go through this. Thank you for sharing your experience! I have a question about the humidity strips you ordered from Talas for the August flood in the Archives. Do you man the Humidity Indicators that come in a roll of 200? I’m not familiar with them. Or did you mean the standard humidity cards? Thanks. I really like your account of that (un)timely water disaster at the state archives. We have this visiting group of archivists at UC Berkeley (Western Archives Institute) and the cons lab will be going over some basic conservation activities and one of them is disasters. I will be showing them how we deal with water disasters. Since our guests are primarily archivists I would like to tell them about your disaster and direct them to your site. Your jpegs also are really good at illustrating “air dry” and team work. I appreciate all the work you put into the description of what happened. Thanks, Emily, for the feedback…hope it is helpful for your group!